The Polar 3D 2.0 Printer creating a 3D printed facsimile of a turbine engine part. CINCINNATI, Jan. 25, 2017 /PRNewswire/ -- Polar 3D is pleased to announce its support of the GE Additive Education Program for primary and secondary schools under which GE Additive will invest $2 million over two years to subsidize Polar 3D classroom packages. Enabling educational institutions to provide access to 3D printers will help accelerate the adoption of additive manufacturing worldwide, a goal GE and Polar share. Applications for the Program are now being accepted. Interested schools may complete the application form here. "We selected Polar because of their commitment to education, strength of curriculum that integrates 3D printing in Science, Technology, Engineering, Art and Math and the open Polar Cloud platform," said Greg Morris, Strategy & Growth Leader of GE Additive. "We are excited to watch the ecosystem grow and develop pipelines of future talent in additive manufacturing." "We are thrilled to participate in the Program and appreciate the opportunity," said Greg LaLonde CEO of Polar 3D. "With GE's leadership and the power of our educational institutions, we believe student access to 3D printing and inquiry-driven project-based learning will reach an inflection point where network effects kick in and the growth of additive experimentation by our students will follow an exponential, rather than linear, trajectory. Now is the time to inform and empower these students for an additive world." For more information on Polar 3D, please visit www.polar3d.com. Polar 3D is a technology company delivering software, products and content to educate, train and enable a world for additive manufacturing through the Polar Cloud. Headquartered in Cincinnati, OH, the Company's Polar Cloud makes 3D printing universally accessible by giving anyone with a browser the ability to create and transform digital models into physical objects. The Company's patented "polar method" of 3D printing sets its printer apart from the field but the Polar Cloud is open and welcomes all 3D printers. It's about educating and enabling a future for additive manufacturing by building the Polar Cloud into the largest 3D printing ecosystem in the world. To that end, the Company and its partners are committed to publishing content on the Polar Cloud to enrich the member experience, including curriculum to drive the advance of Science, Technology, Engineering, Art and Math. For more information, please go to polar3d.com. Good programming languages (like BlocksCAD) support recursive programming. Instead of looping a single set of commands, a recursive module uses replicas of itself as a part of the module definition. Once a module is called, the values of variables are local to that instance of the module. The result is the ability to create complex objects that can't be made with simple loop instructions. In celebration of this capability, we'll create a famous recursive structure, a fractal tree. Fractals are complex structures in which any part of the structure is a replica of the structure as a whole. An entire branch of mathematics (chaos and complexity theory) is devoted to the exploration of these structures. Consider a tree, for example, branches are similar to each other, but their size changes as smaller branches grow out of larger ones. A similar pattern is found in ferns where the whole structure is similar to the smaller parts that make up the plant. I became so engaged by these structures that I wrote a couple of books on the topic back in the 1980's: Discovering Apple Logo : An Invitation to the Art and Pattern of Nature, Addison Wesley, 1983. The language I wrote about, Logo, supported recursion so it was a natural choice. Of course, in those days, the graphics were low resolution 2D images on an Apple II computer ― a far cry from what we can do with BlocksCAD and a 3D printer today. As our tree is being built, the size and length of branches will change, just as they do with real trees. We start by creating a set of global variables used in our structure. Next we define a recursive module called tree. This module uses three local variables ― the starting branch length and width and the depth (number of levels) of the tree. These three variables will have their local values changed during use of the module. All other variables will keep their global values. There are two things to notice in this module. First, you'll see that we don't use the Centered option for the cylinder. This makes it easy to get all the branches connected. Second, the cylinder is tapered from its previous radius at the bottom to the new one at the top ― just like the branches of many real trees. Once this module has been created, we can create our final instructions. When this BlocksCAD program is run, it produces the following tree. I changed the rendering color by clicking on the Render window box with the color swatch and choosing green as the new color since it looks more tree-like. Of course the color of your printed object will be chosen by the filament you use. This tree also looks like a stalk of broccoli. You should do some research to see why this is. 3D Printing in the Classroom — Who Cares? We're excited to bring you this blog post by our Director of Education, David D. Thornburg, PhD. I've chatted with lots of teachers over the years and now that 3D printers are becoming commonplace in many classrooms, a major complaint has emerged: “We got a printer for our class and after the kids made key chains, we didn't know what to do next, so we don't use it anymore." This challenge is so commonplace that I thought I should address it. My view is that any technological tool used in education needs to be evaluated on the basis of its curricular connection. Just because something is new and flashy doesn't mean that it should be brought into classrooms. This applies to computers, tablets and other devices, including 3D printers. In the realm of 3D printing (for example, in the STEAM fields), there are five tasks that form a sequence. These include background on the curricular topic, the design of the 3D parts for the project, the printing of the parts, their assembly into a finished artifact, and experimentation with the object to develop a deeper understanding of the topic. I show this as a loop because the cycle can repeat with embellishments for interesting projects. Every one of these topics is important. Contrast this approach with one that involves simply downloading and printing designs stored on sites like Thingiverse. While such sites are useful for providing models of difficult-to-design parts, they pale in comparison with the learning that happens when students design projects on their own. To illustrate the process, I'll show part of our STEAMtrax high school curriculum project on water turbines. Hydroelectric power provides a significant percentage of the electricity used in the US. The topic of water turbines bridges physics, engineering and mathematics. It allows students to explore Newton's laws, electric power generation and other curricular topics. After learning about the kinds of turbines used in hydroelectric dams, students are ready to design their own turbine for testing. While there are lots of design tools available (many of which are free), this project uses a free authoring environment called BlocksCAD. BlocksCAD has the advantage of being easy to learn, and for supporting the design of complex shapes. Once the design of the various parts is completed, the finished designs need to be printed. In our case this includes the turbine wheel itself, the wheel holder, and the end caps placed on the wheel axle that also allow a small DC motor to be added as a generator. The next step in the process is the assembly of the final system, including its connection to a voltmeter to show how much electricity is produced then the turbine wheel rotates. Once the assembly is completed, the wheel is subjected to a stream of water and students can see how much electricity is produced by a water turbine they built themselves. This leads to some new questions. For example, our first wheel had eight blades. What would happen if we had six blades ― or ten? Because our modeling language is parametric, changing blade designs is as easy as changing the value of one variable. This lets students print and try differenct wheel designs with ease. By using an inexpensive laser tachometer, wheel rotational speed can be measured with different water flow rates and comparisons can be made between wheels with different numbers of blades. Suddenly this activity has a strong math component that aligns nicely with existing standards. From this point, you can go back to the Background step and launch an exploration of different kinds of turbine designs. When viewed from this perspective, 3D printing is a powerful tool in education. Instead of presenting the curriculum in a linear lecture-driven format where it is quickly forgotten, students learn through the process of “constructionism” where the things they learn will stay with them a long time. The approach I just described applies to the curricular materials we develop at Polar3D under the STEAMtrax name. By all means, make a nice keychain if you want, but then please quickly move to curricular-based projects like those provided by STEAMtrax to transform the learning experience using 3D printers as the key technology to do things you simply couldn't do before. The winners of our Haunted Halloween Challenge were certainly scary... scary awesome that is! Here's the designs that shone bright, came out on top, and won some filament! We like this shocked little ghost for its clean design and the fact that it was easy to print a whole squadron with very little support material. We did get one tip from Lily to help potential printers: "In order to fit the candle, size it to 120(%) or larger." Travis' design utilizes a cool star pattern and inverted our tutorial, putting the hole at the top like a traditional pumpkin. We bet the star shadows and lights that display on the surrounding ground — once this print is lit — is pretty impressive. This object is so cool — and the complexity of the spider-web and spider on the pumpkin is such a great touch! Jayna let us know that this object really looks great lit, which is exactly what we were looking for : "This print will be perfect for a table where it glows in a neat pattern." How fun is that?! But more important than the cool spider web, Jayna's challenge entry shows a great lesson of the challenges of new designs in 3D printing: try, try again. Just as we espouse in our STEAMtrax education system, the design process is hinged on trial and error — and Jayna re-tried printing her great design after a filament bind during her first print — and got a successful print on try two! Congratulations to Jayna for her grit and perseverance in making such a great design. Jayna and the runners-up will be contacted shortly for their filament preferences and be sent their prizes shortly! Thank you to everyone for participating and keep an eye out for our next challenge centered around the Thanksgiving table! A letter from our Director of Education, David Thornburg, PHD. Have you ever thought about a really cool lesson on a subject you teach that involves 3D printing? 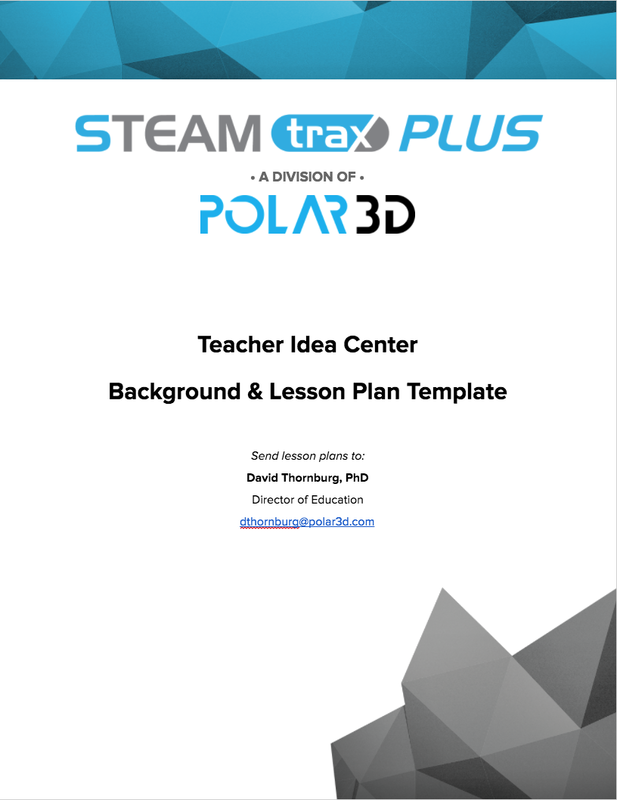 Polar 3D is building the STEAMtrax PLUS Teacher Idea Center — a place where you can put your amazing curriculum ideas and lesson plans to share with the world! Your lessons will be indexed by subject area and grade level with a focus on STEAM topics - although submissions in other areas are more than welcome as well. While our focus is on the K-12 world, we'd love to see college level projects too! Download and use the template here to build your lesson. Send it to Dr. Thornburg, our Director of Education. We will choose a professional mentor to help you tweak and publish your lesson if needed. When approved, your lesson will be posted along with printable files for others to use and comment on in the new Polar Cloud 2.0. There is no cost associated with any of these activities, and your materials will be released under a Creative Commons Copyright. We'll be watching to see how folks resonate with your ideas, and look forward to promoting & rewarding those with the most engaging content! If you have any questions, please send them to Dr. David Thornburg. We can't wait to see what great ideas you come up with!